If I apply that thought to quilting, it means experiment, have fun and just do it! That is most definitely my goal for 2014. One of the ways I intend on doing this is to try something new from every quilt magazine or book I read. I have already started doing it and have created a couple of interesting things. This quilt top was inspired by a fiber art piece by Michael Brennand that was pictured in a recent Surface Design magazine. His piece was created using fabric, wire, and paint on a wood panel. In his piece, he used a lot of deep reds with bits of color. This caught my eye immediately and I thought it would be really fun to make a quilt that caught the same color essence. I really liked how his piece was so saturated in color – so that was what I tried to do as well. I did add in the black and white fabric in the border though to help make the colors pop a bit more. This was a lot of fun to sew and I am looking forward to having my friend Sondra do the quilting on it. I’ll post a picture once that has been completed. The next piece I fiddled around with was a collage heart. 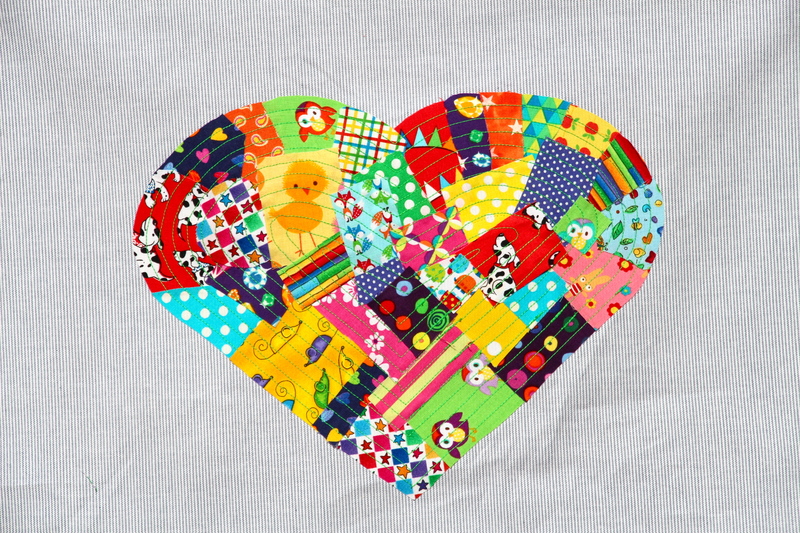 The little collage heart was inspired by a project in one of Tula Pink’s books. I think I am going to add a couple of borders to this and make it into a pillow for one of our window seats. I was thinking about re-purposing a pair of Erica’s bright red jeans for this – that could be fun! Hmmm… decisions, decisions! Today I am working on a quilt made from some of the fabrics I got for Christmas. They have an African flavor to them and I love the rich, vibrant colors. Here is the center. I am about to start working on the next block which will go around the center. Both blocks are from Tula Pink’s 100 Modern Quilt Blocks. Love your saturated red top! 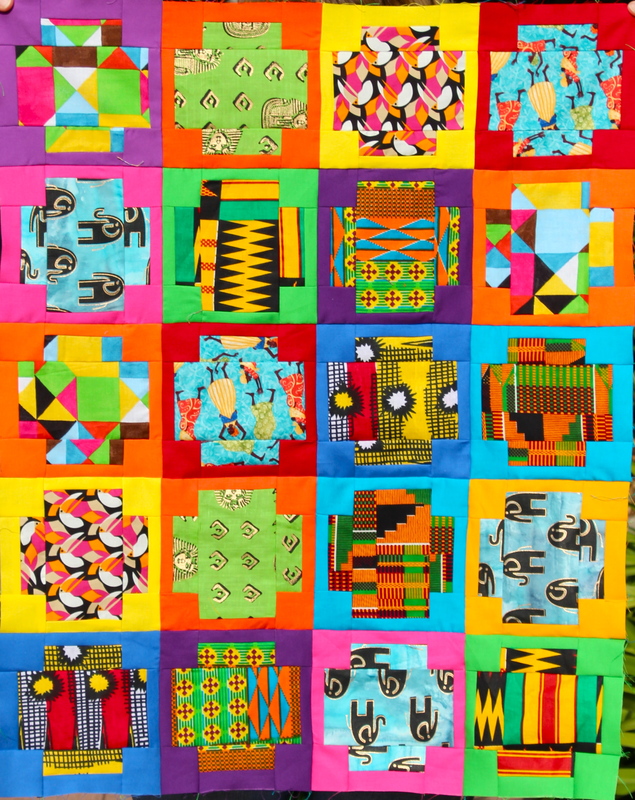 African quilt captures the African designs so well! Just love it! Wow! You’ve been busy. The quilt top with the deep red is crazy and I love it. The deep reds in the center pull my eye in and it reminds me of a deep pool of water with the other colors floating to the top. It’s a beautiful piece of abstract art that you just can’t stop looking at it. You have really jumped into 2014 with big plans. the projects you have shown are wonderful. I really like all the red in the first quilt. That is stunning. Great projects, I have Tula Pinks book but have yet to make any of the blocks, yours are so inspiring! Great fabrics and designs….I am now stalking you and your kwiltiness! 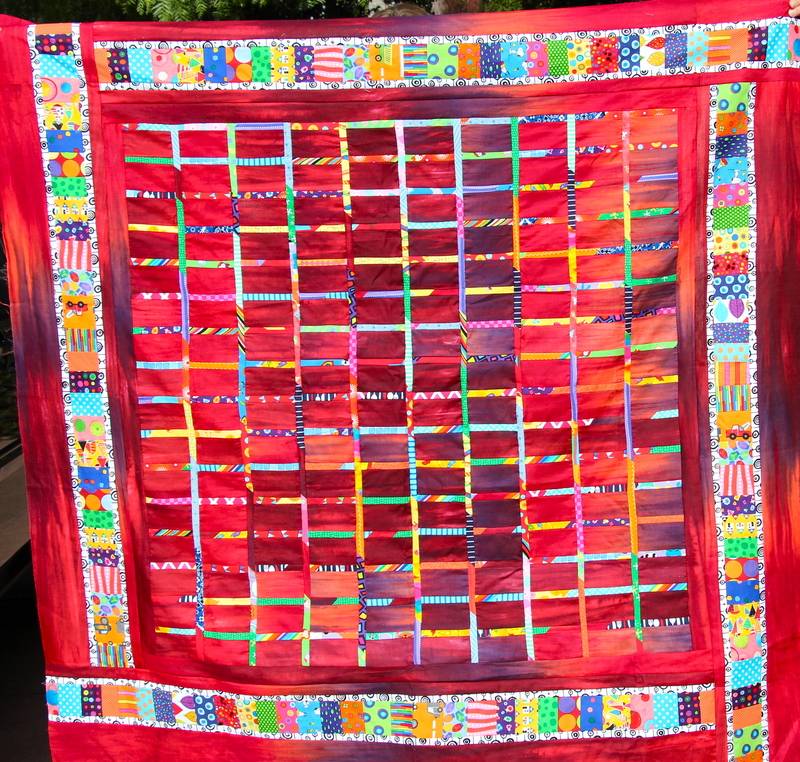 Wow, that red quilt certainly is saturated!!! I, too, got the feeling I was looking at a reflection on a watery surface, the way you have place the reds and what look like plums/purples. It’s fun to see someone have so much fun with bright colors! Thank you so much! Believe it or not, I only used one fabric for the background. It is a really cool fabric with red being the dominant color, but then it changes into that dark sort of plum color in different places. It made for such an interesting backdrop! I liked it so much that a few days ago I went back and bought the final 6 yards on the bolt! 🙂 I can’t wait to make something else with it! Very nice and I really like all the intense colors. Great projects! I LOVE the red one, looking forward to seeing it all quilted. Thanks 🙂 I think I am going to make a second red quilt. Sure love all that color saturation!